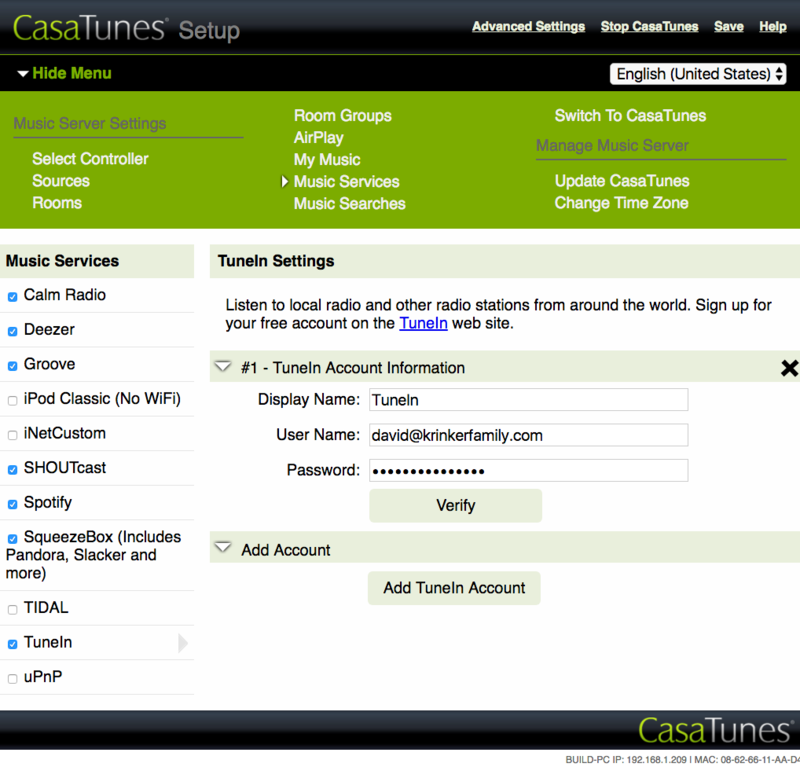 CasaSetup is the browser based Administrator tool used to configure your CasaTunes music server. In addition to CasaSetup, you can also use the CasaTunes Apps for iOS and Android to configure your music server, although some functionality is only available in CasaSetup. Before we begin configuring CasaTunes, it’s important to understand certain terms that will be used in this document. Zones - A zone corresponds with one speaker pair. Rooms - A room refers to the location of the zone(s). If you have a large room, you may have more than one zone in it. In most cases, the terms can be used interchangeably because there will only be one zone per room. Room Groups - A room group allows you to manage a group of rooms, as if it were just another room. 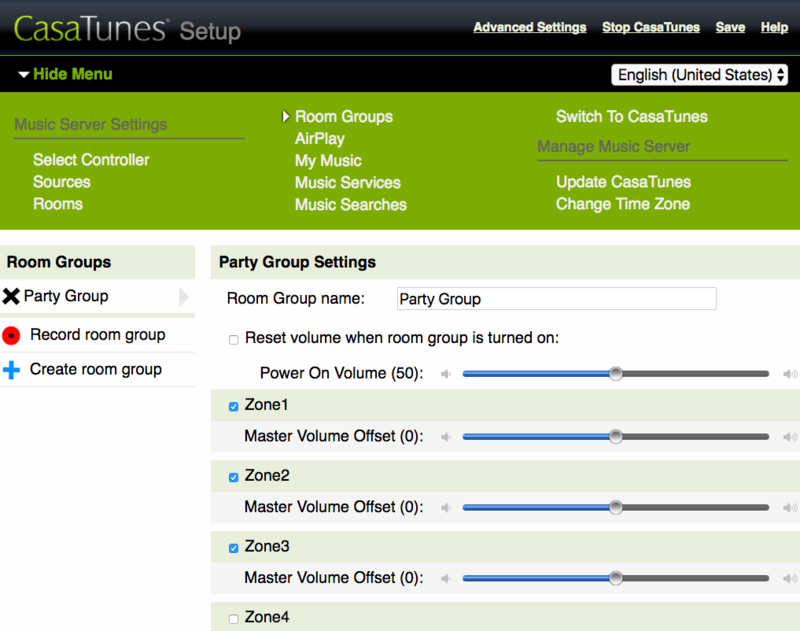 When you power on a room group, CasaTunes powers all rooms in the room group. 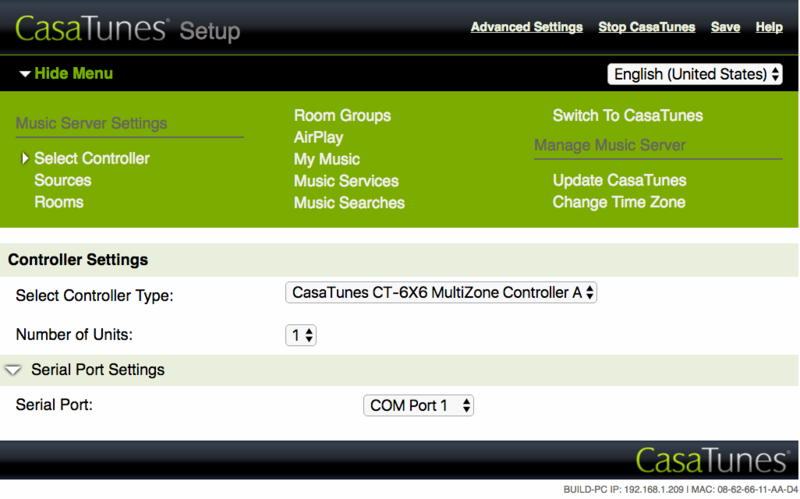 Similarly, when you change the source for a room group, CasaTunes changes the source for all rooms in the room group. Finally, when you change the master volume for a room group,CasaTunes adjusts the volume level for all rooms in the room group, by an equal amount. Room groups are useful for implementing scenes. Sources - There are two types of sources in CasaTunes: CasaTunes Media Players, and tuners. You can switch any source to any zone, or group of zones. Each CasaTunes Media Player has a queue. When you select music to play, you add the music you want to play to the media players queue. When you add music to the queue, you can opt to replace the music in the queue, add music to the queue, or add music and play the newly added music. If you are playing an album on a source named Player 1 and you want to listen to the same music in another zone, you can select that zone and then also select Player 1. If you want to play something different in another zone, you’d have to select another source, such as Player 2. Using the CasaTunes Apps, select the Group Rooms menu option to share the music playing in the current room with other rooms, and it will automatically perform the steps above for you. Tuner support in CasaTunes is limited to supporting legacy Onkyo, Russound and Nuvo tuners. Music - CasaTunes can play music stored on your music server and/or other devices on your home network, can stream music from a variety of Internet radio and premium music services, including Calm Radio, Deezer, Groove music, Pandora, SHOUTcast, Spotify, Tidal and TuneIn, and can play music that is streamed from one or more iOS devices, using Apple Airplay. You can use CasaSetup in one of two modes, basic and advanced. You can switch between these two modes, by clicking on Basic Settings or Advanced Settings option in the CasaSetup header. If this is the first time you are using CasaSetup, we recommend you use CasaSetup in Basic mode. Once you are familiar with CasaSetup, and configuring your music server, you can switch to Advanced mode, however, for most installations, this should not be necessary. Click on the Stop CasaTunes link to stop or restart CasaTunes. It may take a minute or two for CasaTunes to stop. Once, it stops you will be prompted to Start CasaTunes again. Click on the Save link to save any changes you made to the current page. CasaSetup automatically saves your contents when you switch between pages, however, if you have made changes to a page, you must click on the Save link, before you close the page in the browser. Click on the Help link for more information about the current page. The CasaSetup footer contains the CasaTunes logo, and if a newer version of CasaTunes is available, a link to take you to the Update CasaTunes page. You will need to provide the MAC address to CasaTunes Support if they need to remotely login to your music server. It is recommend you keep this information, so that it is readily accessible. The sources page allows you to configure your sources. You can keep the default source names, or you can rename them, for example, you might want to assign each family member their own source, and name them: David's Player, Jodi's Player, etc. You can change the name for a source. After changing the source name, click Save in the top right corner. You can hide any sources that won’t be used by selecting the Hide Source checkbox. CasaTunes automatically configures Sources 1-2 as CasaTunes Media Player sources, and configures the CasaTunes Player Settings automatically, for all CasaTunes CT2-xxZ music systems. The rooms page allows you to configure your rooms. You should rename these to match the rooms in your home. You’ll need to determine which zone is connected to each speaker pair in order to name the rooms accurately. You can do this by powering each zone, one at a time, and then updating the room name to match the room where you hear music. After changing a name, click Save in the top right corner. It's not necessary to adjust the equalization and volume settings, but you can if desired. If you want to add a room group, follow these steps to record a room group. Recording a room group is the easiest way to create a room group. You should only add room groups after you have finished configuring your rooms. Power on each room you want to include in the group. Set the volume to the desired level in each room. Click Record room group and all the powered rooms will be included, with the volume offsets specified in step 2. Name the room group and click Save. When you change the master volume for a room group, CasaTunes maintains the differences in volume for each room in the room group. Using the CasaTunes Apps, you can adjust the volume for a specific room in a room group, however, when you turn the room group off and then back on, it defaults back to the original volume settings for the room group. Click Create room group and name it. Check the rooms you want to include in the group. Set a volume offset, if necessary. CasaTunes allows you to receive AirPlay streams from one or more iOS devices, as well as stream music to one or more AirPlay speakers or devices. Check the Enable receiving AirPlay... option if you want to be able to AirPlay music from an iPad, iPhone, iPod Touch, or iTunes on a Mac or PC. It’s checked by default. Check the Always turn off... option if you want the CasaTunes zones to turn off when the AirPlay stream disconnects. It’s checked by default and is recommended. Check the Enable transmitting... option if you want to be able to transmit music from CasaTunes to AirPlay speakers or other devices. This is unchecked by default. After checking this box, click Save and then go back to the Rooms page. You should see a list of your AirPlay devices. Enabling AirPlay transmission adds a 2-second delay between songs. This is due to the buffering requirements specified in the AirPlay protocol, and is normal. We recommend turning transmission off, unless your setup requires an AirPlay speaker or device. We recommend using the CasaTunes App for Android and iOS to configure My Music settings. The Apps simplify browsing your network to locate your music on Macs, PCs and other storage devices, and configuring the Location setting for you (see below). Use My Music (also referred to as QuickSync), to play your own music collections. 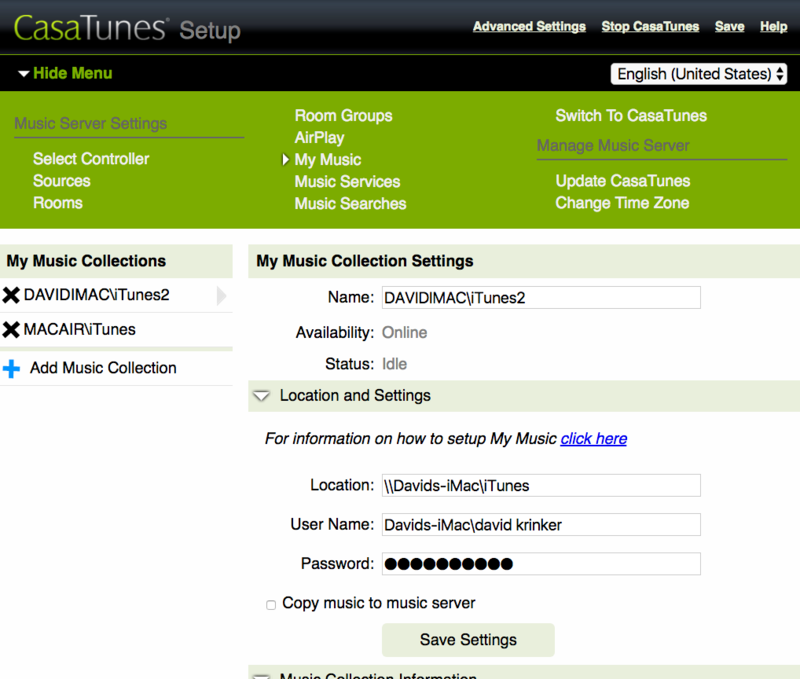 QuickSync can discover, catalog and play music residing on Macs, PCs and other storage devices on your home network. You can optionally copy your music to your music server. Learn more about QuickSync. After you click on Save Settings, QuickSync will begin the process of discovering and cataloging your music, and optionally copying your music. This can take a while, depending on the number of songs, and whether you selected to copy your music. Note that, you can select and listen to music before this process is fully completed. Once completed, you can view the information about your collection, including the number of songs, albums, artists, genres, playlists, the size of your collection in bytes, and how long it would take to play every song in your collection. To remove a music collection, simply click on the X next to the collection name. Removing a collection, deletes the catalog for the collection, and if you enabled copying your music to the music server, will delete this music from the music server. It does not affect the original music. We recommend using the CasaTunes App for Android and iOS to configure your Music Services settings. Click on each music service that the customer has and enter their credentials, if required. Some music services, like Pandora and Slacker require you use the SqueezeBox plugin. Check out this video to learn how to set up and use Squeezebox. By default, CasaTunes will enable playing your music service on all sources. You can override this default. For example, you may want to restrict using your Spotify Account #1 to Player 1, Spotify Account #2 to Player 2, etc. Most music services allow you to configure multiple accounts. This allows each family member to use their own accounts when listening to music. For example, if you have a Spotify Family account, each family member can use their own account, and have access to all their playlists and favorites. For music services that support multiple accounts, click on the Add <music service> Account to add an additional music service instance. You can provide an account name for each account to make it clear in the Apps which account you are using. To delete a music service account, simply click on the X, next to the account name. When configuring your music service accounts you may encounter a button prompting you to Verify your credentials, Authorize CasaTunes to use your account, or both. When setting up an account for the first time, you should always verify your credentials, to make sure that CasaTunes has the proper credentials to access your account, and authorize your account, if required. When authorizing an account, you will be redirected to a browser page and prompted to allow CasaTunes access to your account. Before authorizing CasaTunes, make sure you are logged into the correct music service account, and if not, logout and then log in to the proper account. Once, the authorization process is complete, you will need to switch back to CasaSetup in the browser. When using CasaSetup in Advanced Mode, you can assign an account exclusively to a source, for example, David's player. Once configured, this account is only available on David's player. You can configure CasaTunes to automatically download a new CasaTunes update when available, or you can manually perform updates. 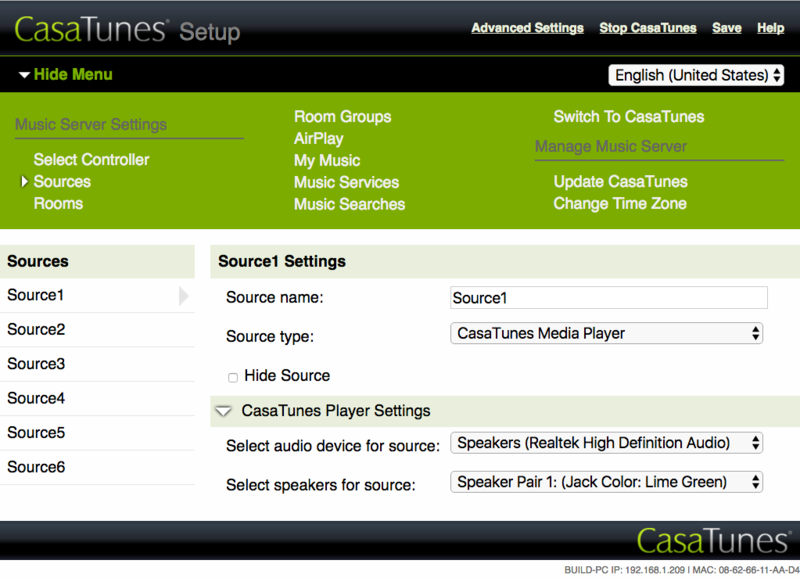 If you select to manually update CasaTunes, CasaSetup displays a message in the footer when a new version is available. You can also check the downloads page on the CasaTunes website for the latest release. To automatically install updates, select the Automatically install CasaTunes updates checkbox and enter the time you want to check for, and install updates. Click Save to save your settings. To manually install an update click on Install Update. CasaTunes will not perform an update if any rooms are powered on, so it is recommend you select a time when it is unlikely the system is being used. In addition, CasaTunes checks whether the system must be restarted prior to an update, and if so, will restart your system for you automatically. If the system is in use, or the system had to be restarted, then the update is postponed until the following day. 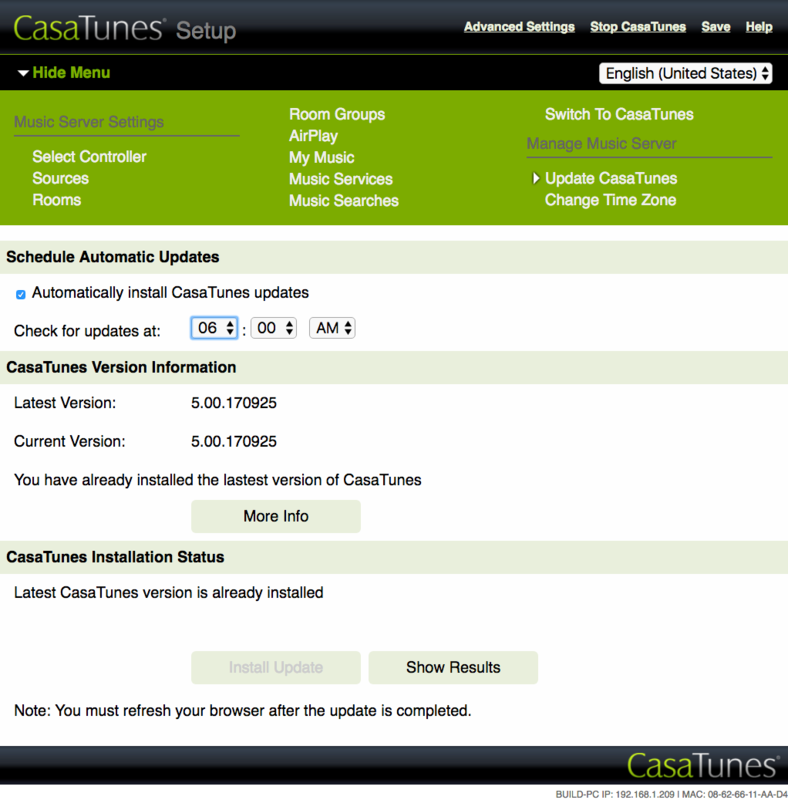 CasaTunes only automatically installs major updates, not minor releases. You can manually install minor releases. Occasionally, when performing a manual update, your browser might display an error. If this happens, close the CasaSetup page, and re-open CasaSetup in a new page. You must properly configure your time zone for CasaTunes to function correctly. You should verify the time is also correct, and contact CasaTunes support, if the time of day is not correct. 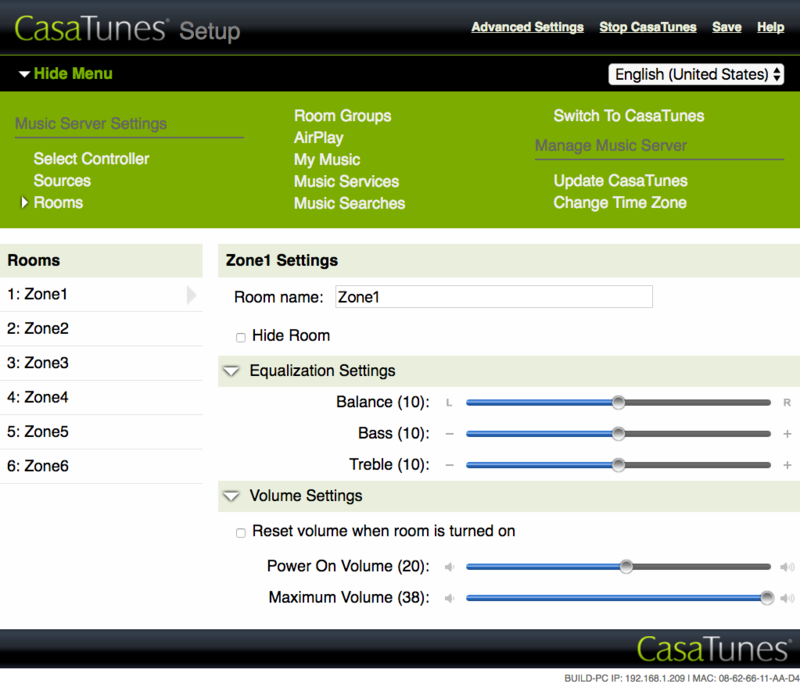 Once you have completed configuring your CasaTunes system, we recommend you backup your project. Click on the Backup button (after you have entered your email address), and CasaTunes will email you a backup of the project, along with instructions on how to recover your CasaTunes system, should it become necessary. You should save this email in a safe place. Click on the Enable CasaTunes startup, shutdown and other email notifications checkbox to receive emails each time CasaTunes starts up or shutdowns. Selecting this option allows you to pro-actively manage your customers site. CasaTunes will automatically notify you when an unexpected error occurs that causes CasaTunes to stop. CasaTunes will automatically attempt to recover from these failures (up to 10x). CasaTunes will notify you whether it was able to successfully recover, or not. Even if CasaTunes is able to automatically recover, you should contact CasaTunes Support, and they can examine the logs for more information on the cause of the interruption, and make sure the issue is addressed. CasaTunes supports aggregated searches, which means CasaTunes can search for music across multiple music services. You can limit your searches to include only those music services you want to search. Querying multiple music services usually takes longer, so typically you should limit the music services to search. In the CasaTunes Apps, if you are in the Now Playing view and perform a search, CasaTunes only searches the current music service that is playing, and as part of the search results, provides the option to perform the search across all configured music services. When browsing your music, and you perform a search in the Home folder (where all your music services are displayed), CasaTunes automatically searches all configured music services. Once you begin to browse a music service, and you perform a search, CasaTunes will only search the music service you are browsing. Last.fm is a service which allows customers to track the music they listen to (called scrobbling) and allows them to analyze and get music recommendations based on what they listen to. Last.fm is a great way to discover new music based on what you listen to. Before you can enable scrobbling in CasaTunes, you need to visit the last.fm site and create a last.fm account. To enable scrobbling in CasaSetup, check the Enable last.fm scrobbling checkbox, enter your last.fm credentials, verify the account, select the music services you want to scrobble, and click Save. Once configured, CasaTunes updates last.fm each time you play a track from one of the music services you selected to scrobble. To analyze the music you listen to, and to discover new music recommendations, visit the last.fm site. This page allows you to remotely access your music server, and is used primarily by Tech Support, for music server maintenance and trouble shooting. We recommend you contact Tech Support to setup remote access to all the music servers you manage. CasaTunes uses an alternate, more robust solution for accessing your remote music servers. Remote access allows you to respond to customer issues in a timely manner avoiding truck rolls. You can use this page to configure the Serial or IP API settings to use. Please contact Tech Support for more information. The Serial API documentation is available from the CasaTunes website in the Tech Notes section. You should only enable Enable third party control of CasaTunes if you are developing a custom solution and you want to use the Serial API using RS-232 or IP. You should not enable this option is you are using one of CasaTunes' home automation and system control drivers for Control4, HDL, RTI, URC, etc. 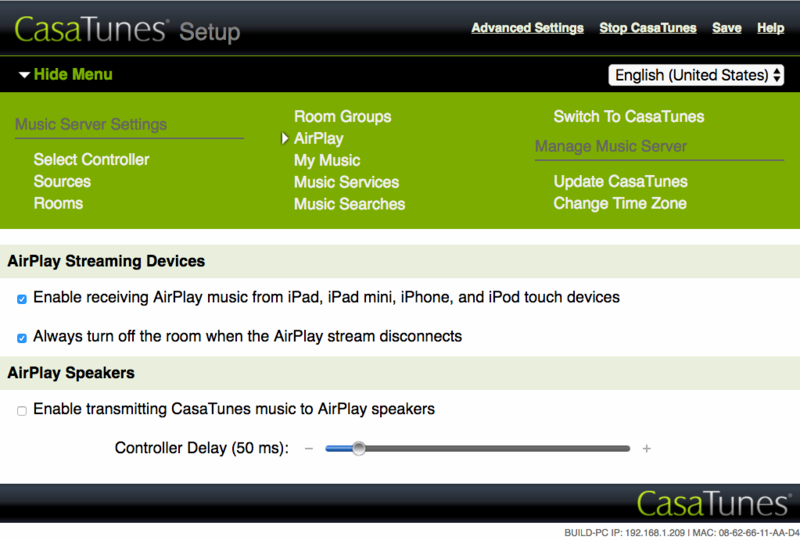 We recommend you use the REST APIs for controlling CasaTunes. Selecting this option will open the CasaTunes web browser. You can use the browser as an alternative to using the CasaTunes Apps for Android and iOS. This is a useful administrator tool, but should not be used by customers. The CasaTunes browser does not include all the functionality, or ease of use, provided by the CasaTunes Apps. There are no plans to continue to develop or enhance the CasaTunes browser app.